I think at some point in our childhood we have all played with (or at least seen/heard of) Sunprints. It is this amazing paper that you set out in the sun, with objects on it, and a print of them is left behind. When I got my first kit, as a child, I spent the whole day outside and used all of the paper it came with. I adored these things. It wasn't until recently that I rediscovered these at a Science Museum's gift shop. I was brought back to my childhood and I wanted them. A few months later Nate presented me with a package of them! Soon after I purchased Martha Stewart's Encyclopedia of Crafts. Flipping through it I found the holy grail of sun printing...fabric! 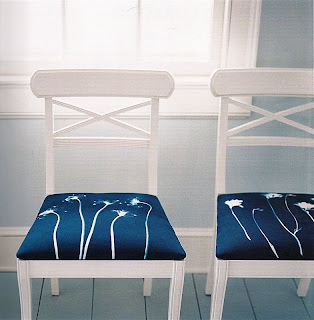 In her book she shows the fabric being used as seat cushions and I just LOVE it! Just think of all of the different things you could make with the printed fabric. The look with the chairs is beautiful and the color just pops. I would love to do this in our dining room. I would have each chair be a different print. For the room itself, maybe do a half wall with the lower half being bead board and the top half in either a similar blue or a gray. Also a chair rail would work well. I think having a good gray in the room would just make the blue really stand out in the room. Here's a few palettes that I think would be great color combos (depending on how blue the fabric is). My favorite would be three to four colors (the blue, white/off white, gray, black). What do you think about the chairs? Would you ever do something like this in your home?